I put a call out on Twitter last week for good things for inverse functions. I got a few helpful responses but nothing that was really the thing. So here's what I made. The day before, we had worked with inverse functions as doing and undoing equations. I started with ciphers. Students walked in and the board said, IQQF OQTPKPI, DGCWVKHWN DTCKPU! with no explanation from me. I just greeted them and took attendance and acted nonchalant. One kid sidles up and goes all sotto voce, "Miss Nowak, does the first part say Good Morning?" Since the good morning part was a pretty easy crack using context, after a minute or two someone notices that all the letters are shifted over by two, and can't keep from blurting it out, and we're off. I had one of them explain how the encoding was done with this example. Then, they wrote secret messages using their own shift n cipher, traded, decoded. I babbled a little bit about Caesar and Enigma (I really want to show them this Numberphile video, thanks for the tip Mike Lawler). The encoding and trading and decoding only took about ten minutes, we went through one from beginning to end: what was your message, how did you encode it, how did you decode it. The alphabet was written on the board along with a counting number under each letter, the idea being that if your encoding added 5, the decoding would be subtract 5. The next day, I wanted them to notice all the nice things that are true for functions and their inverses: the symmetry over y = x, that the inputs and outputs trade places, that f-1(f(x)) = x. So, each student got one of these cards. They figured out the inverse of that function using the technique from the day before. There was another student in the room with the inverse of their function, so they had to get up, talk to people, and then sit with their partner. Each pair of students got one of these (the first page). 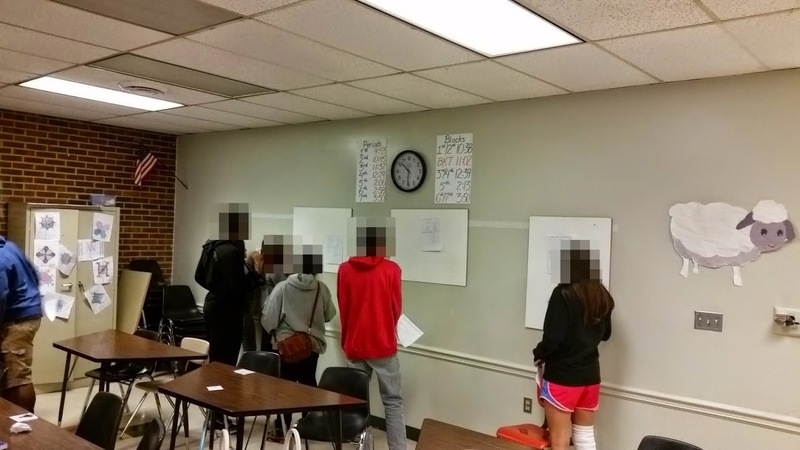 They tacked their cards to the paper, completed the tables, graphed each function in a different color, and computed f-1(f(0)) and f-1(f(1)). They needed various levels of support interpreting instructions, but it helped to have them working in pairs on the same piece of paper - there was a natural reason for them to talk to each other to figure it out. My colleague Lois is teaching the same course, and got a coach to come in for one of her sections, which was a great move. As the mini-posters were completed, they were hung up around the room. I said, hey, you all had different functions and now they're up there with their inverses. There are some neat things that are always true about a function and its inverse. Walk around and look at them all, and write down at least two things you notice. If you look at page 2 of this same document, the first question has space for them to write down observations. They sat back down, and they shared their noticings with the class. I had Desmos up on the projector with some pre-loaded functions, so we had a concrete thing to point to as they were sharing. Then they got to work on the rest of that page 2, which is lifted directly from lesson 6 of this eMathInstruction textbook (thanks Sam for pointing me to this resource). Some of them were able to just do those problems, some needed help restating the given information and what the problems were asking. So there you have it. I especially liked this lesson for the social, discussion, get-up-and-move-around aspects. These Algebra 2 classes have not responded positively to problem-posing when they haven't been "shown how" to do a problem first, but, we have been successful with lessons like this where we break the questions into clear chunks while still requiring that they do some thinking and figuring out. It's a bit of a tightrope walk but that's how you get down a tightrope, right? One tiny step at a time?